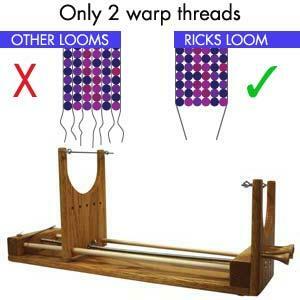 "Unlike traditional looms , which leave you with multiple warp threads to weave into your design, the Ricks beading loom leaves you with only 2 warp threads at the end of your project. Its ergonomic design and adjustable lengths make this an ingenious device which will replace all other Beading looms. Comes with a comprehensive user guide and made of quality Wood. PATENT PROTECTED!" This loom comes flat packed for easy transportation with full assembly instructions included.